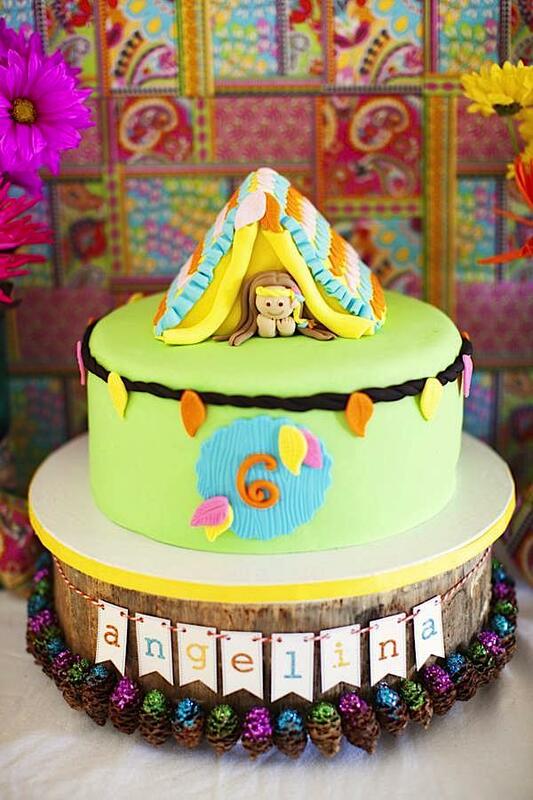 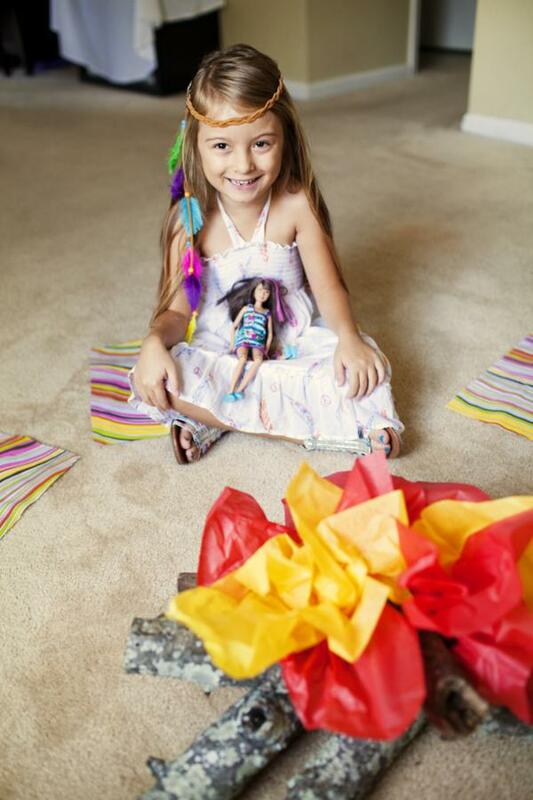 This RETRO 70’S BARBIE CAMPING 6TH BIRTHDAY PARTY submitted by Maria Davis of Love & Sugar Kisses is absolutely darling! 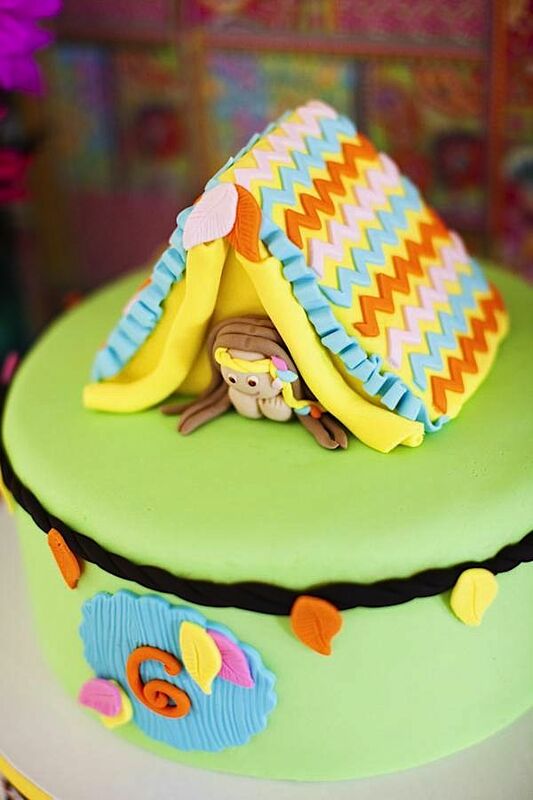 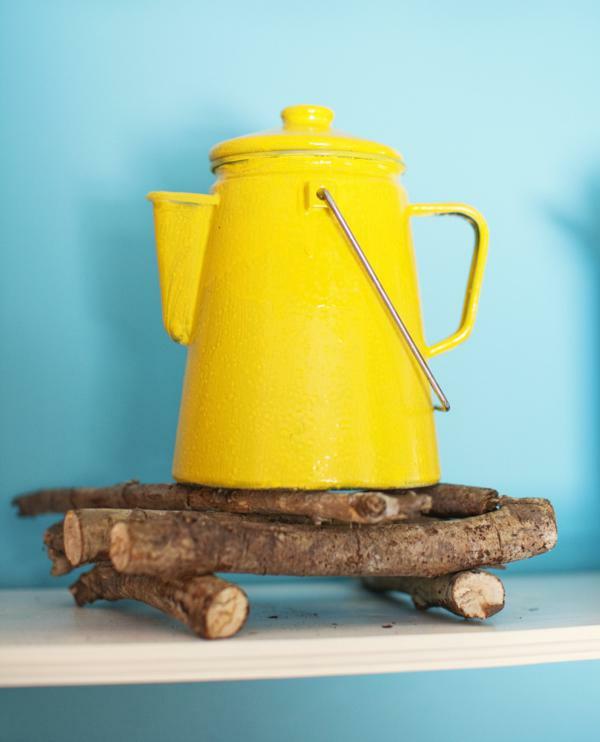 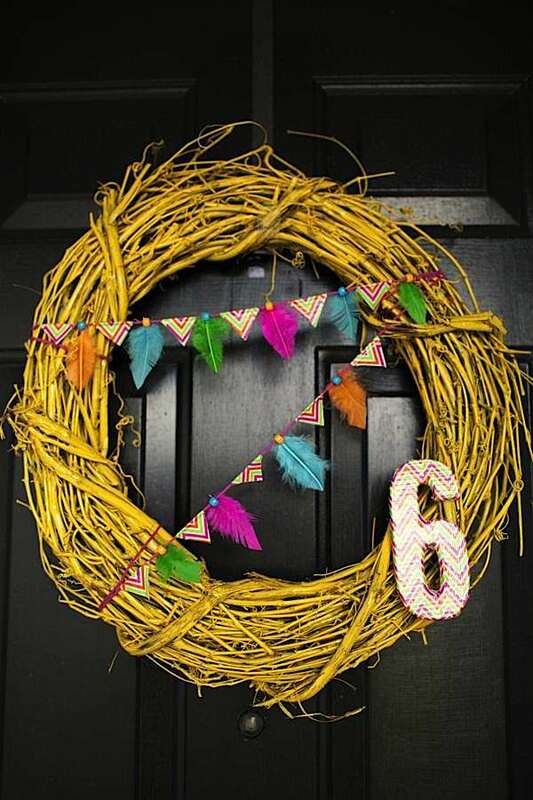 What a creative twist on your regular camping themed celebration! 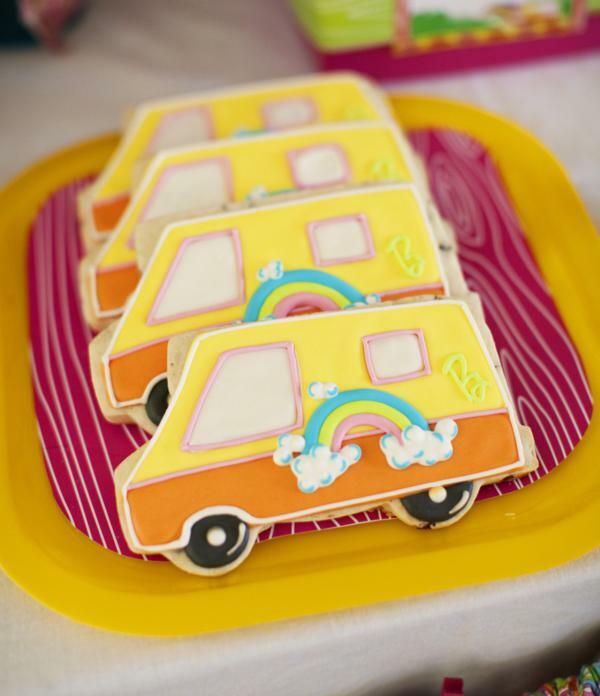 I adore the vintage barbie touches…take a look at the darling barbie camper van cookies & boxes, for example! 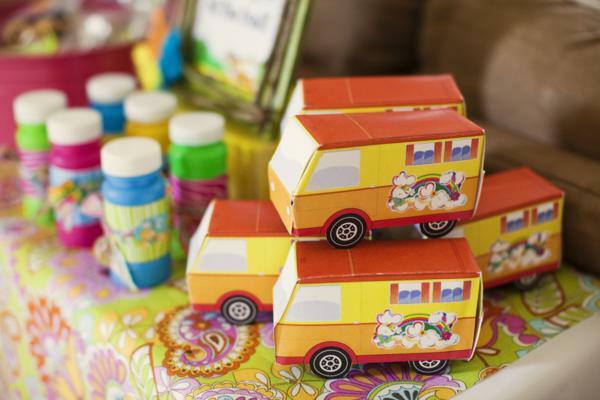 Maria said- “My party theme was a 70’s Vintage Barbie Camping Party! 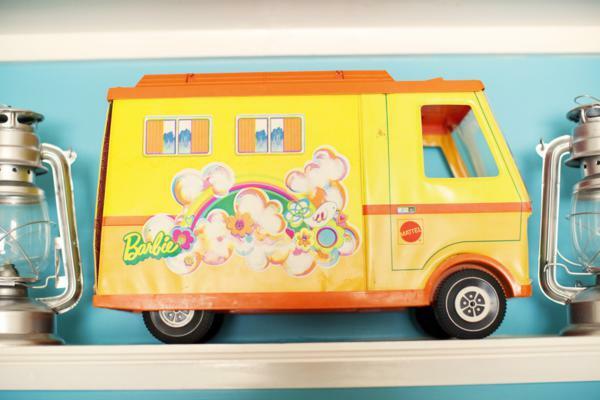 The inspiration for the party was the 1971 Barbie Camper, which I found on ebay. 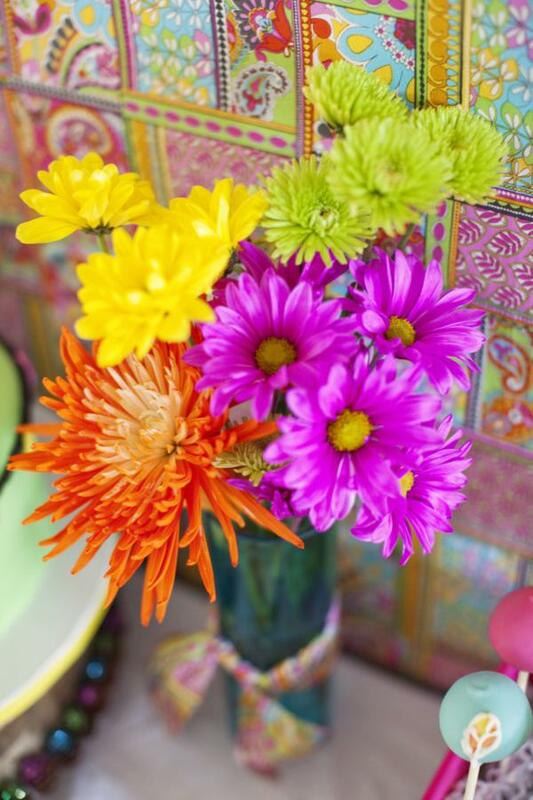 I wanted to evoke the spirit of the 70’s by using colorful and girly fabrics throughout the party and used bright pink, aquas green, yellow & orange as my colors. 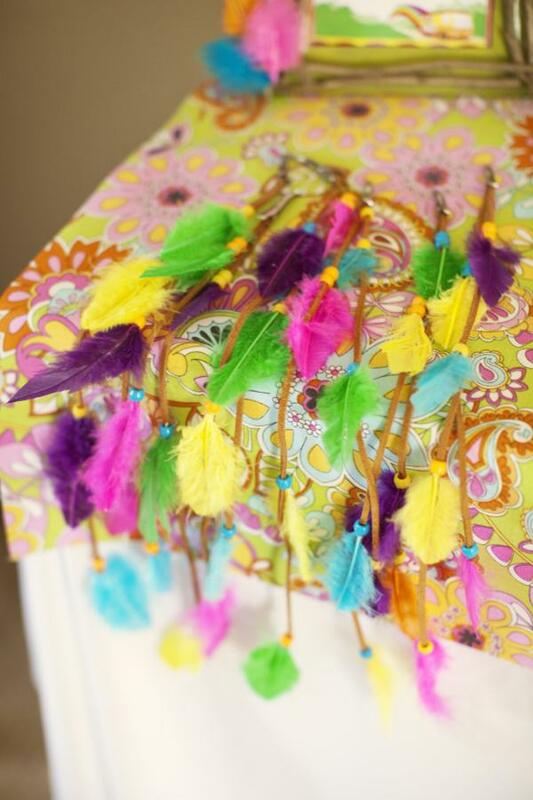 I used feathers in several of my decorations and made 70’s style feather hair clips for all the girls. 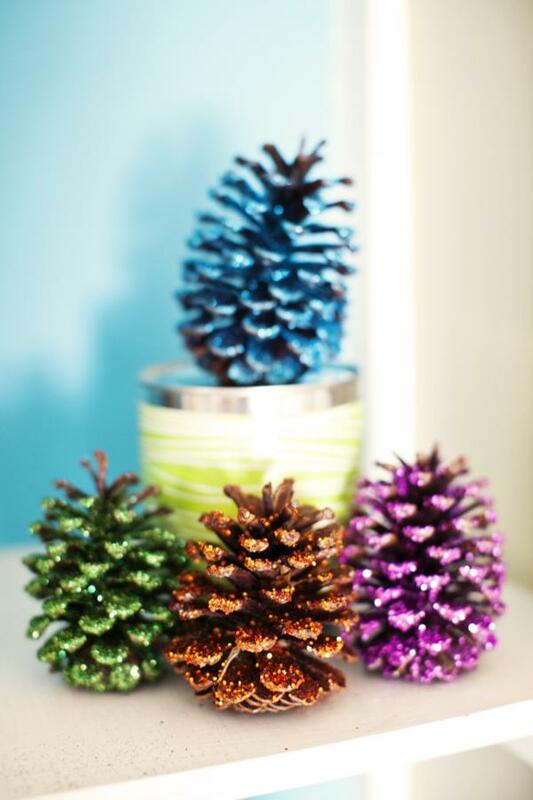 I used some touches of nature like twigs for the frames, pine cones and a tree stump cake stand. 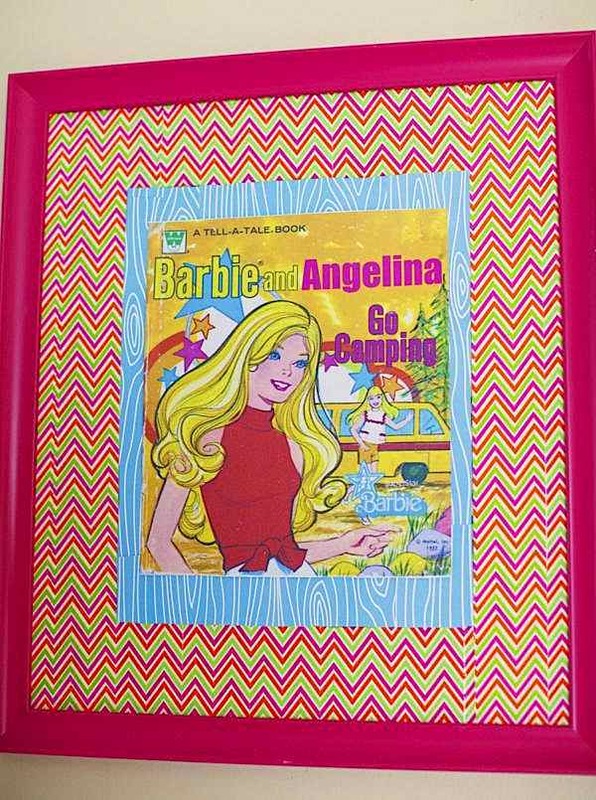 But I added some Barbie sparkle to them as well! 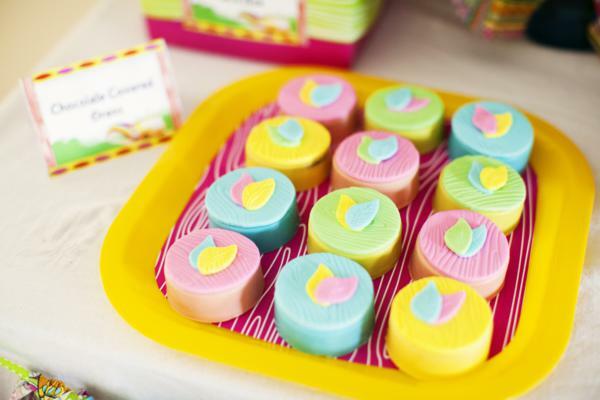 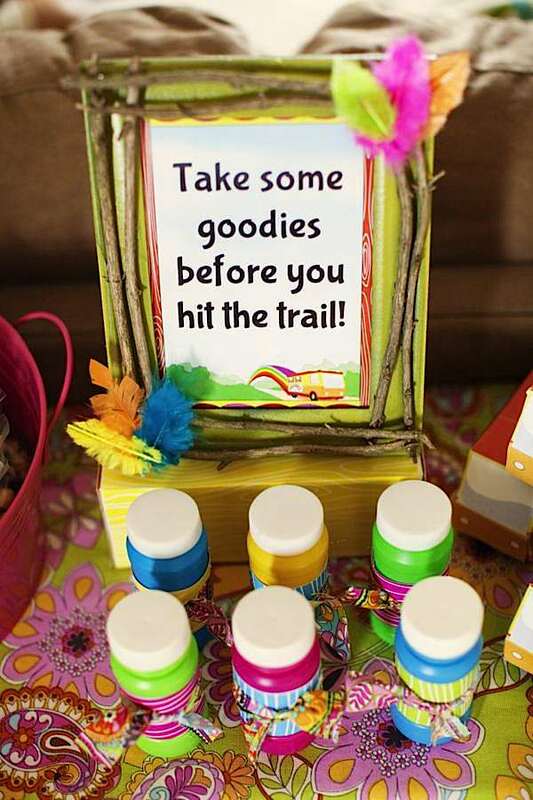 Piggy Bank Parties created all the beautiful printable products including the amazing favor boxes which were detailed replicas of the Barbie Camper! 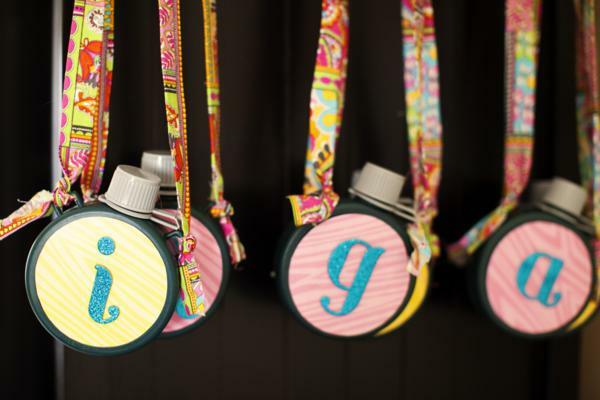 Inside each camper were Barbie stickers & bottlecap necklaces. 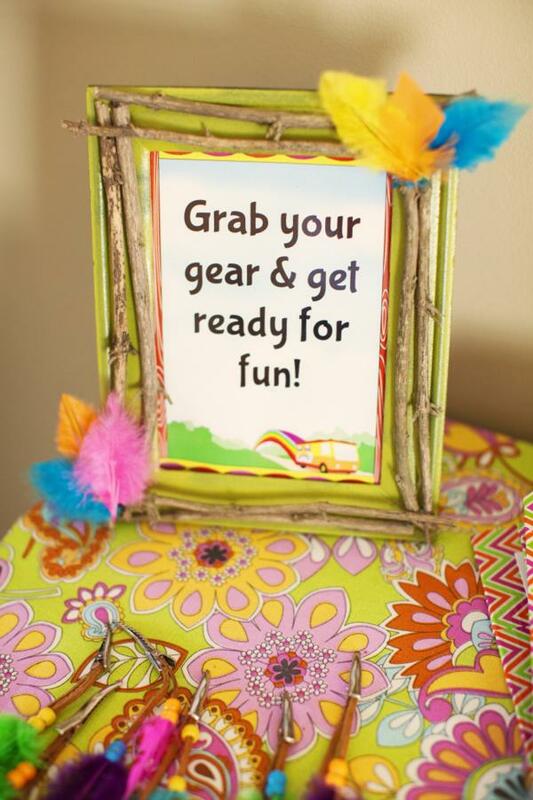 We had several party activities. 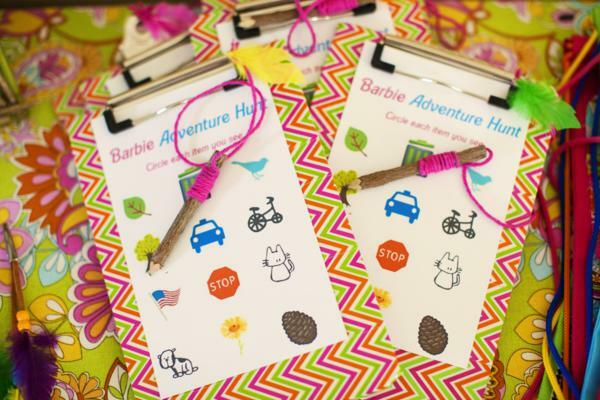 We began with a nature walk and each girl was given a decorated clipboard with items to look for, an embellished canteen, and backpack. 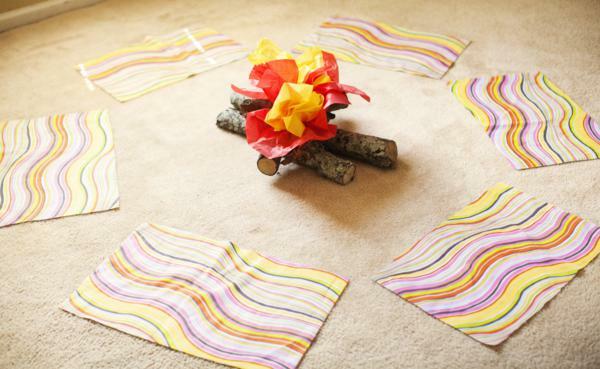 After lunch we sat around our faux fire and sang campfire songs. 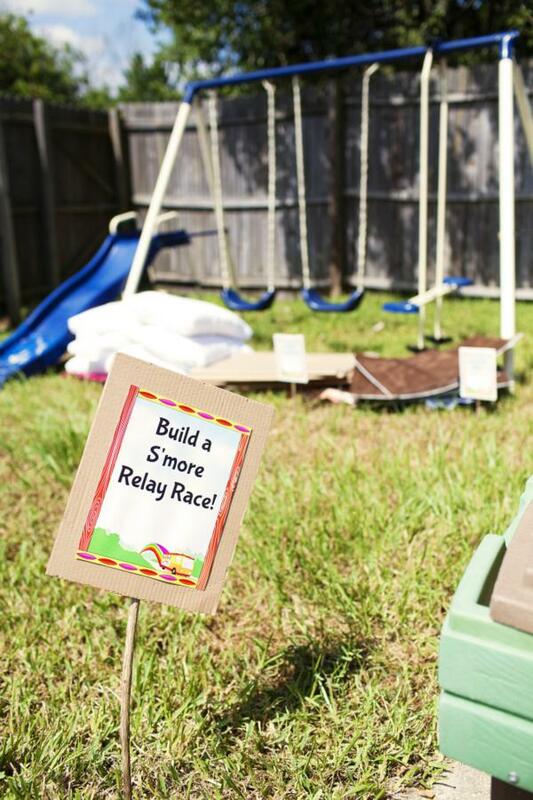 Then we went back outside for a s’mores relay race. 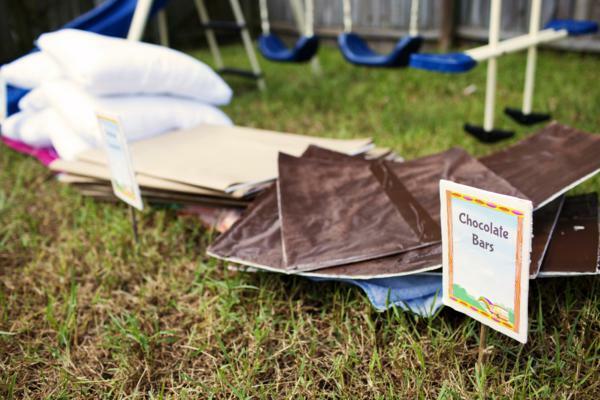 The girls were divided into teams and had to assemble s’mores using large pillows and graham crackers & chocolate bars made from foam board. 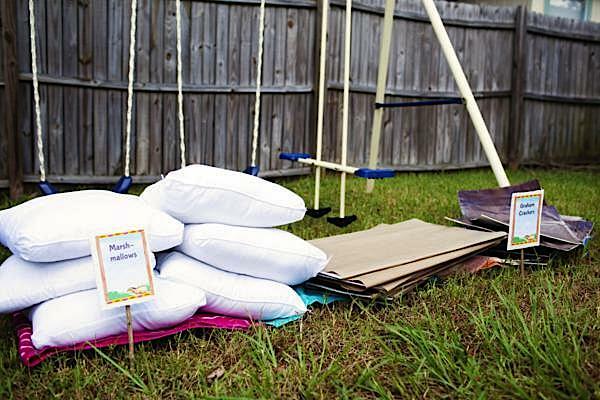 It was a hilarious site and they had a blast! 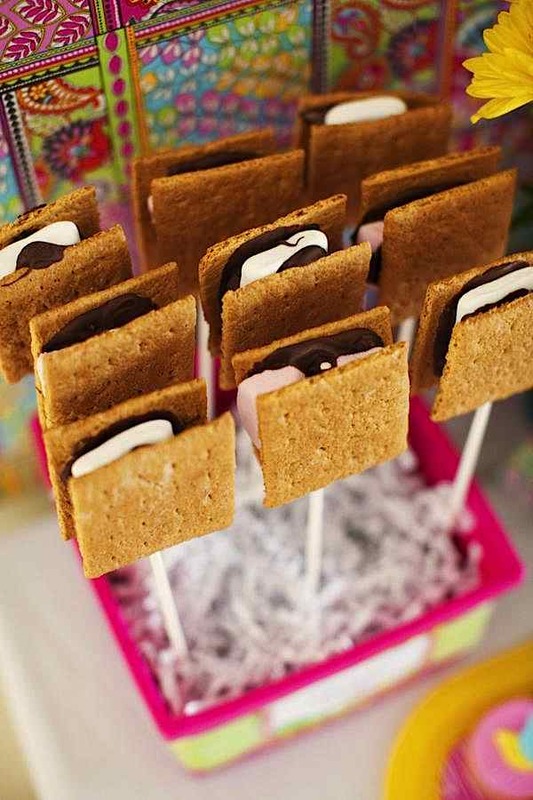 The dessert table included cake, designer Oreos & s’mores on a stick all made by me. 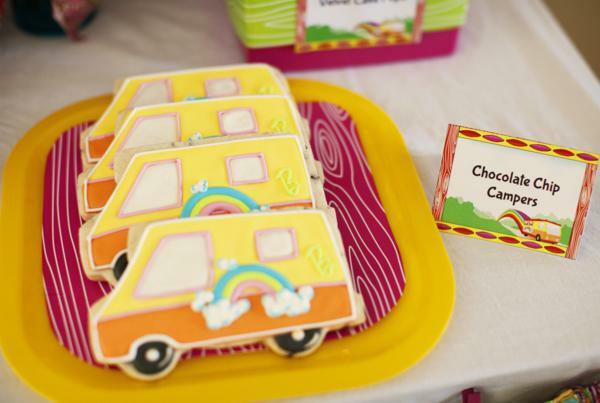 Beautiful cookies designed to look like the Barbie camper were made by Bambella Cookie Boutique. 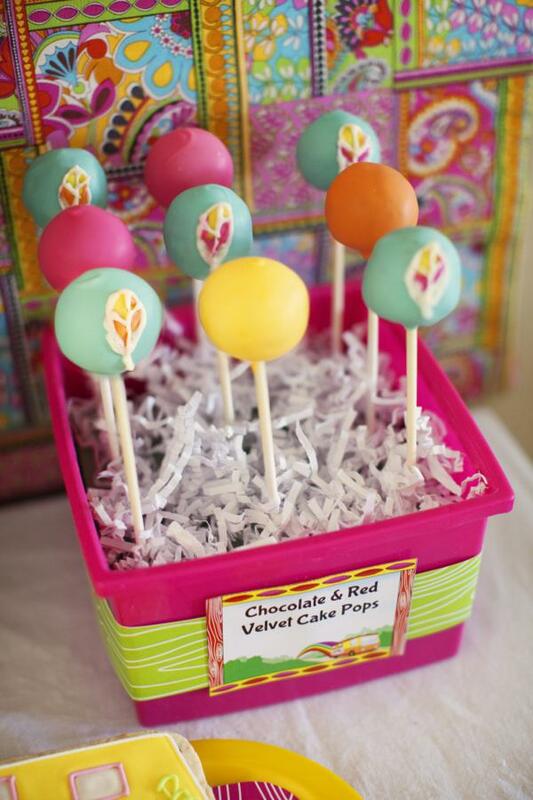 Delicious cake pops in the bright party colors and decorated with feathers were made by Cuter than Cake. 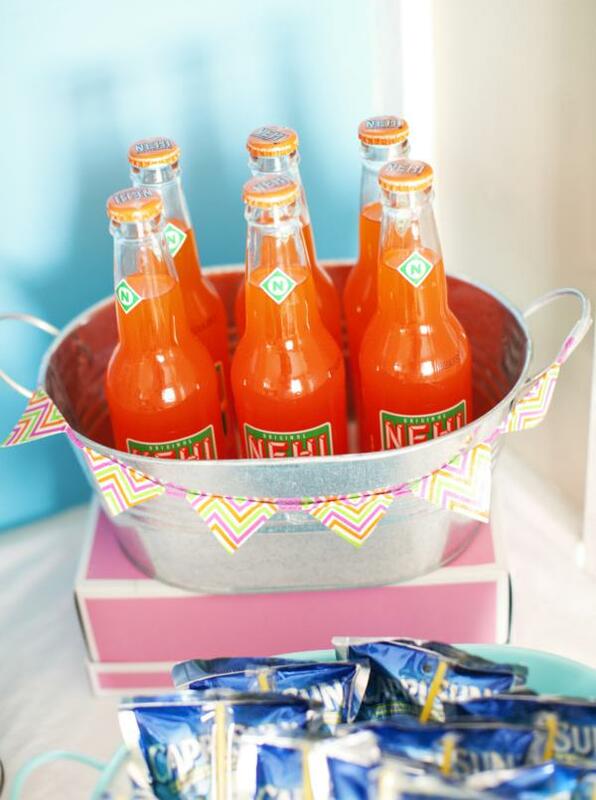 We served camp-style hot dogs & chips for lunch along with a 70s favorite soda, Nehi! 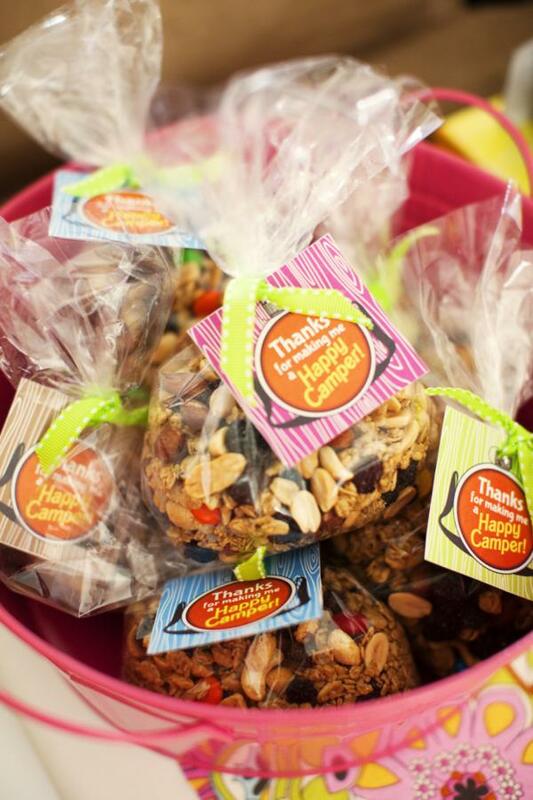 In addition to their camping supplies, each guest received a bag of trail mix & bubbles along with their camper favor box! 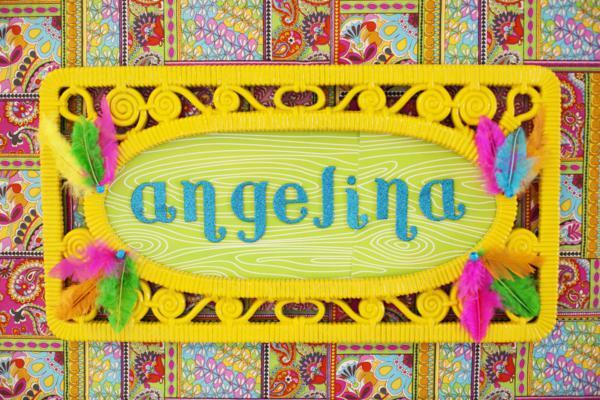 Maria created an amazing party for Angelina! 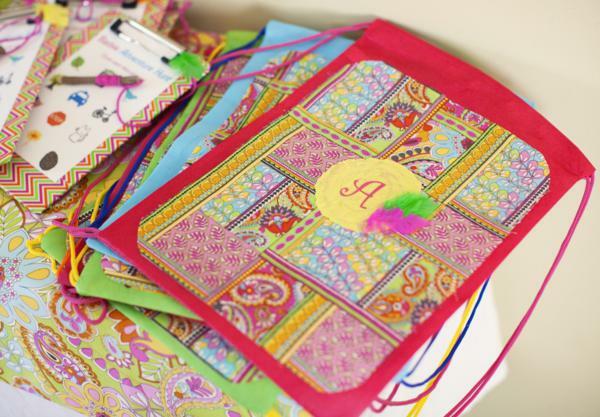 Loved all of her little touches and thrilled to be a small part of it! 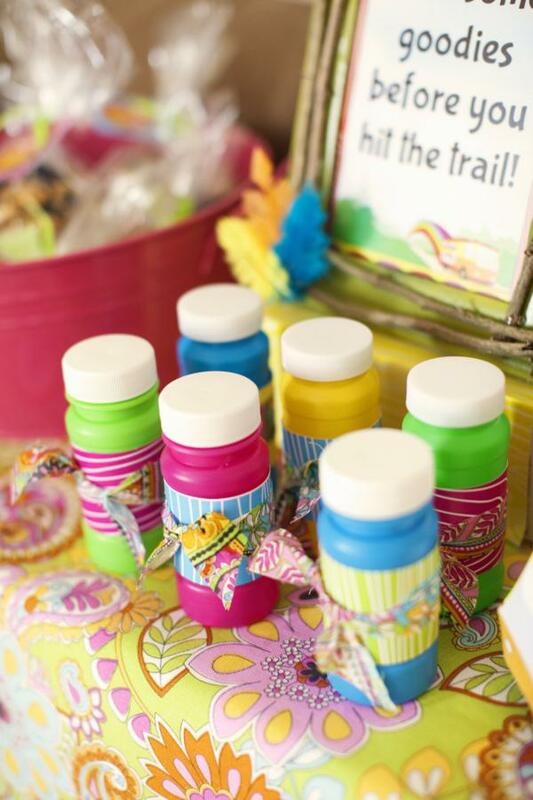 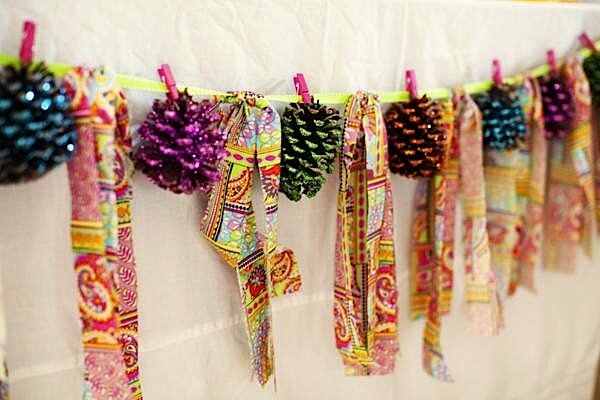 What a fun looking party and I love the vibrant colors. 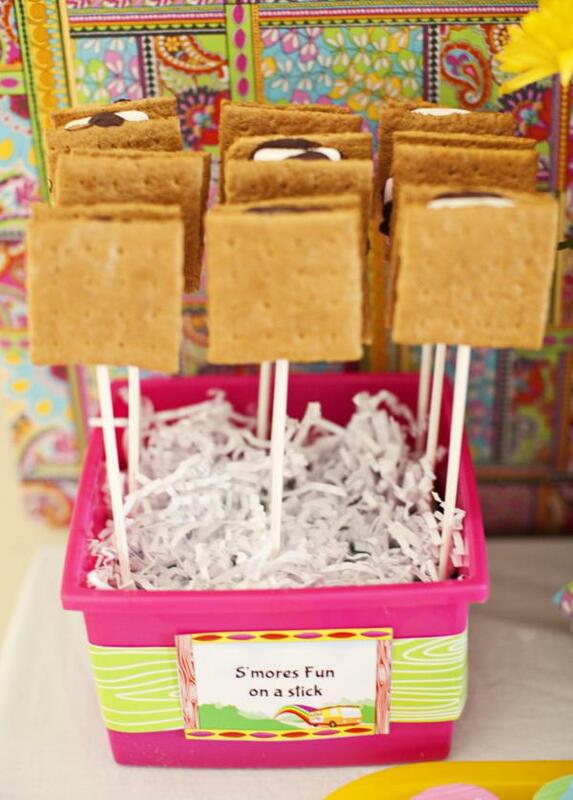 So adorable and fun! 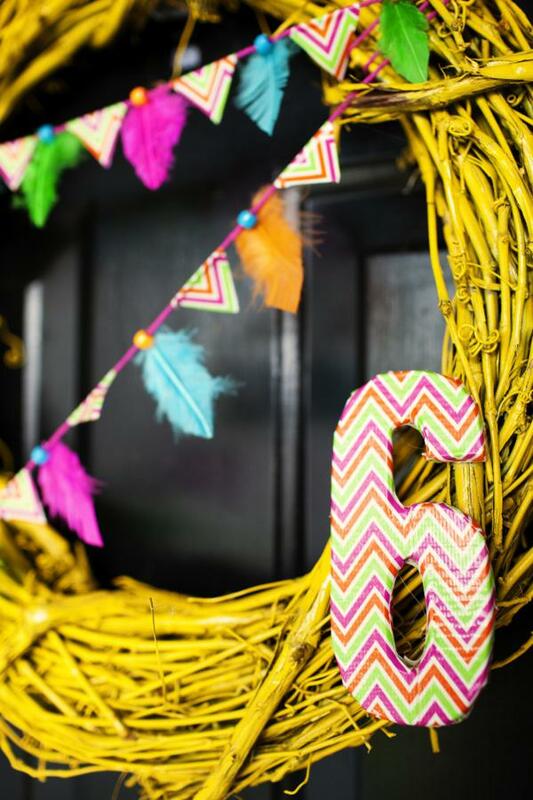 I love all of the feathers! 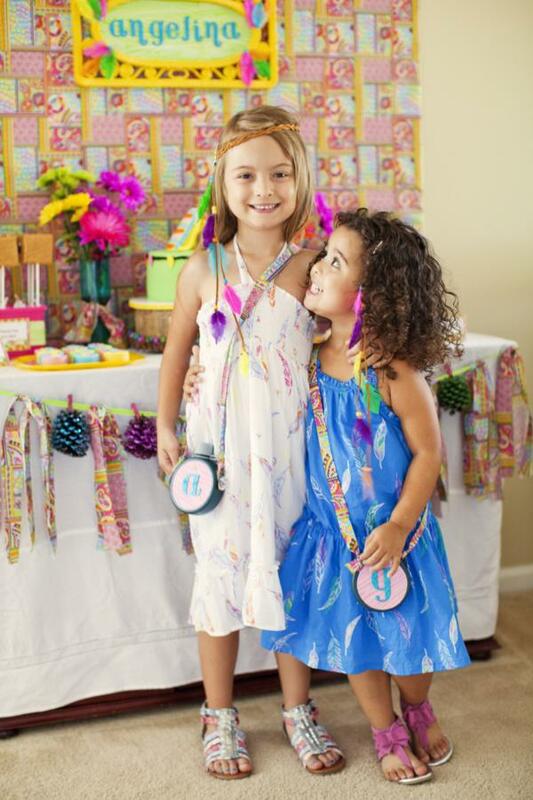 The girls look like they had a wonderful time! 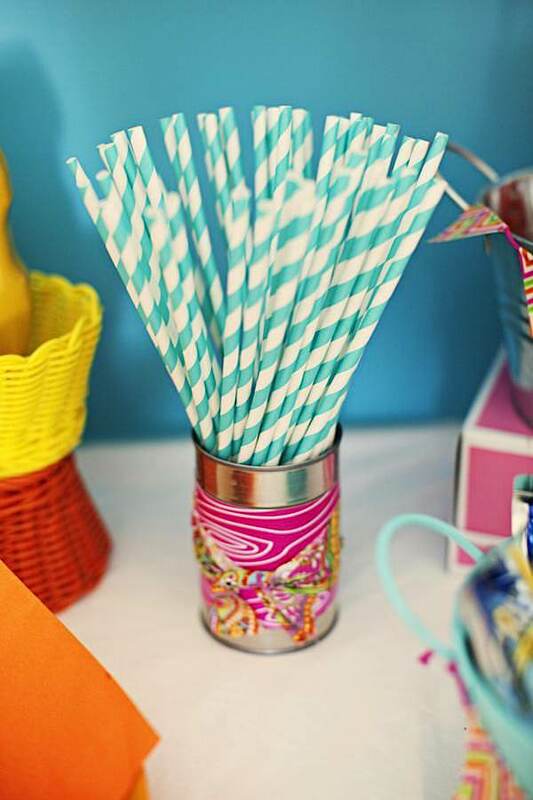 You could easily turn this into a party for a teenager or young adult too! 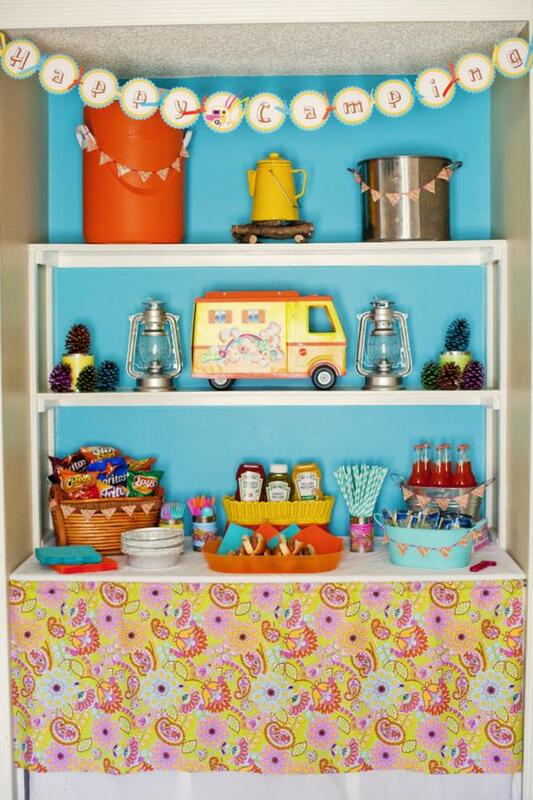 I had that Barbie camper as a little girl!!! 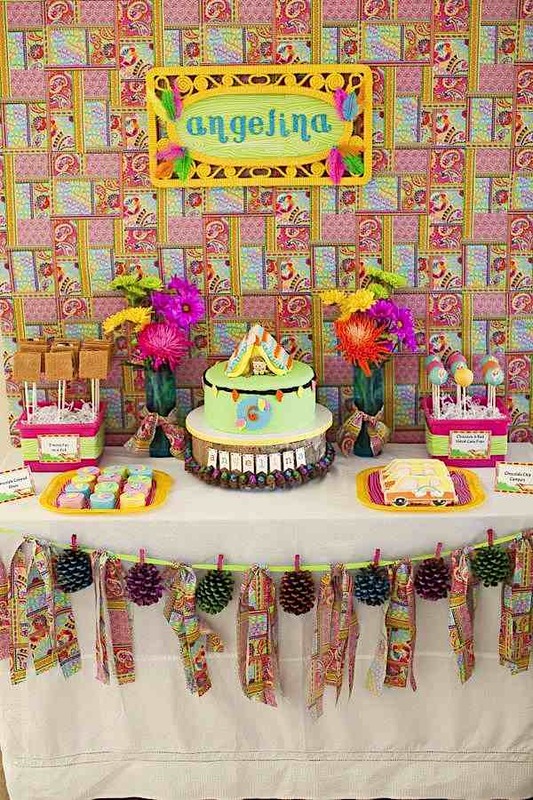 What a cute party.